We know that presidents continually seek to engage their boards in ways that add value. 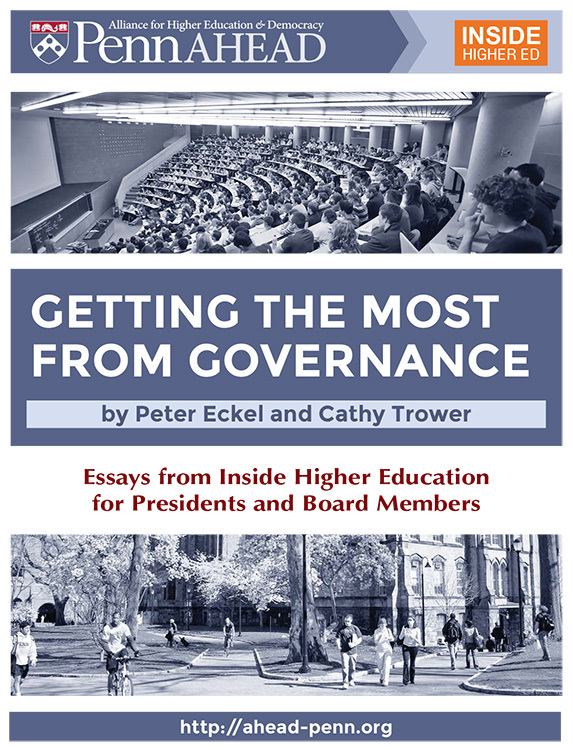 To assist them, Penn AHEAD’s Senior Fellow and Director of Leadership Programs, Peter Eckel, together with Cathy Trower of Trower and Trower, wrote a series of essays on board governance for Inside Higher Education. We anticipate that you may have seen some of these essays throughout the year, and wanted to share the entire series as one single booklet. We hope that you will find some value in these essays. Please feel free to share them with leaders and board members you know. As you explore the questions and opportunities related to your board and its work, please don’t hesitate to reach out to ahead@gse.upenn.edu or to Peter Eckel at eckelpd@upenn.edu.